In 1978, my grandparents, Warren and Frances Ashen, started a holiday tradition that I keep very close to my heart. Each time all of us would gather for a major holiday meal we would sign a white double-sized flat sheet. We could draw on it, write our names on it — whatever we wanted. ”I read about it in a magazine and it sounded good,” my grandma told me recently. As a child, I remember eagerly waiting for the markers to be placed on the table. First, I had to find what I wrote the year previously because this was really important stuff! Next, I had to decide what I was writing or drawing that year. 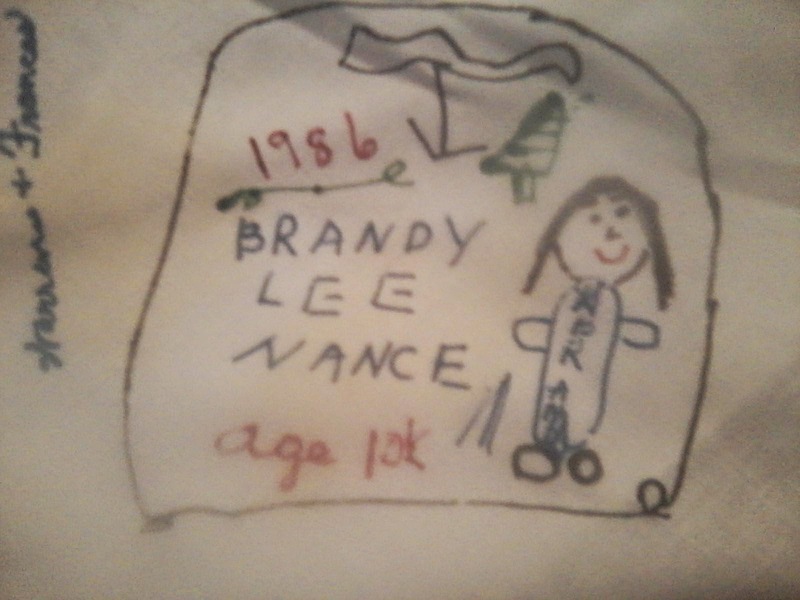 Most years, since I was so young, I drew a picture and stated my age. 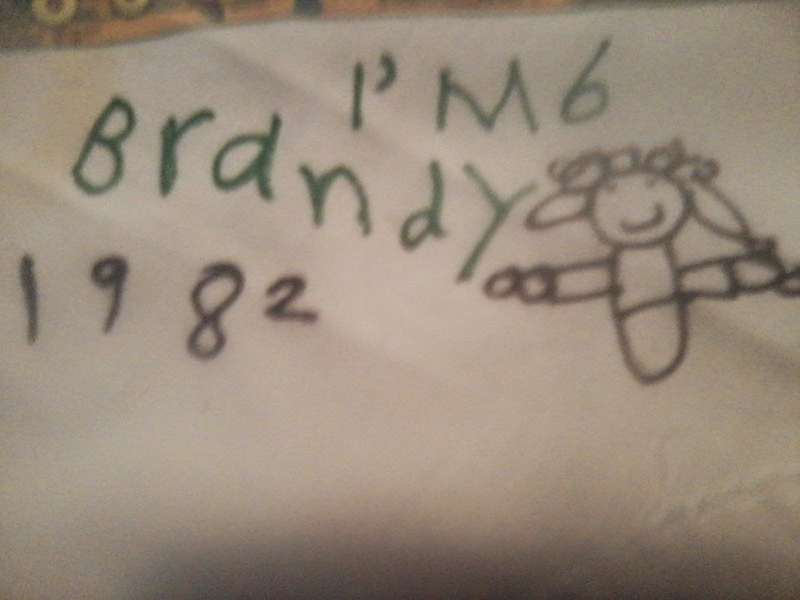 In 1982 (I was born in 1976), I wrote my name and “I’m 6” accompanied by a Glo-worm looking person with a happy, smiling face. If you don’t remember what a Glo-worm looked like (or if you don’t remember it at all), Google it — it was a toy introduced in 1982 and perhaps the inspiration for my drawings. In 1986, I was 10 and I drew a Christmas tree and another Glo-worm-looking person (but this time it had feet). FYI, I don’t pretend that I was ever (nor ever will be) the artist in the family. In 1987, I was 11. Finally, the person I drew resembled a person (well, sort of because she had red arms and legs and green feet). I also drew some stars, another Christmas tree and used a few different colored markers. I even included “I love mom and you (though I’m not sure who the ‘you’ was)” in my drawing that year. Last week, I spoke to a few family members about their memories of the tablecloth. My mom said she used to love to watch us kids draw and color on the tablecloth as the smells of the holiday meal cooking made their way into the room. My brother, Dalton, recalls how the tablecloth made him feel. Oh yes, I too, remember the kiddies’ table. My cousin, Jamie, enjoyed looking back at all the years before. 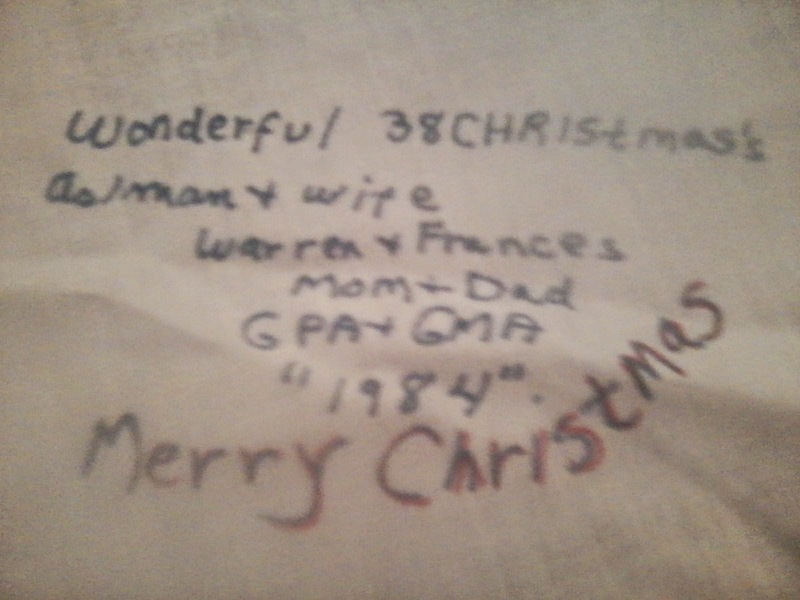 The tablecloth preserves family memories, my grandma said. My Aunt Gloria liked the idea so much that she started her own tablecloth with her children and grandchildren and has some advice for others wanting to do their own. Years later, as an adult, I look at the tablecloth every time I’m at my grandma’s house. It’s enough to choke me up. It is far more than a tablecloth — those are memories. Memories of laughter. Memories of love. I can almost smell the food, hear the sounds of family chatter and feel the love in the room. From my family to yours, I hope everyone reading this has a beautiful holiday season. So what happens when a co-worker in the newsroom decides to start cleaning and then decides to switch desks altogether? Which seriously happens like once every 10 years at the paper. I’m not really stretching the truth — not much anyway. It’s a rare day when we clean around here but when one of us does it, the bug usually spreads and it becomes a friendly little competition. 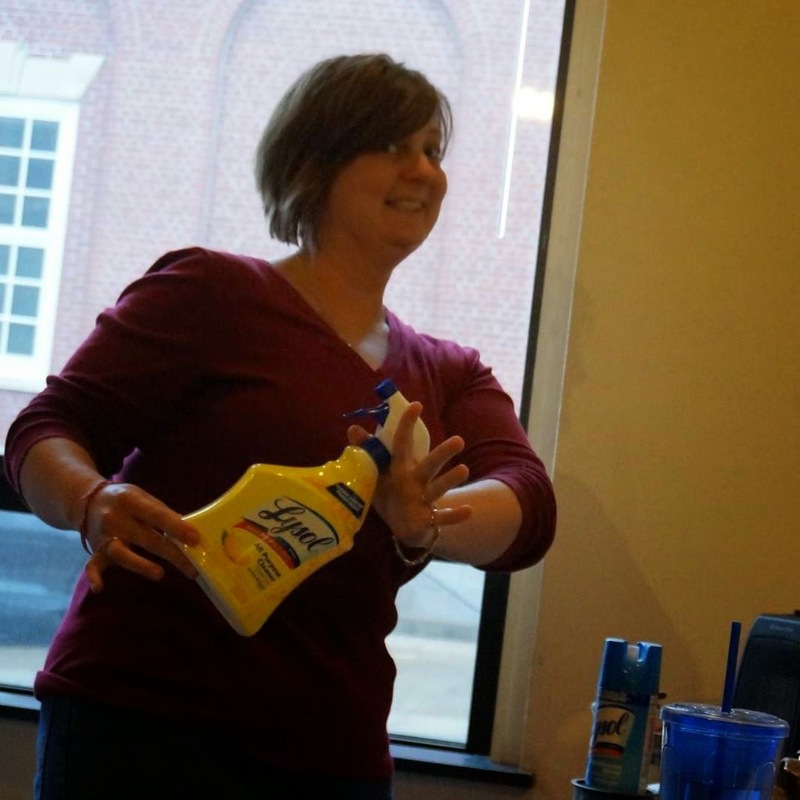 What’s even funnier is that cleaning seriously freaks out coworkers who aren’t in the newsroom. A reporter here, Kathleen, took photos of Jessie’s empty desk after she had moved to another one — texts ensued from a co-worker who isn’t in the office this afternoon. Apparently suddenly-empty desks in the newsroom causes a bit of a panic. But life is good, my desk is clean (because, of course, I can’t let Jessie’s desk be cleaner than mine)! Kansas is a beautiful, amazing place. Last night, while wandering around in a rural area, the sun lined up perfectly with a combine, resulting in the photo to the left. I love to wander around looking at things — even if I’ve seen the route dozens of times, it’s never quite the same. 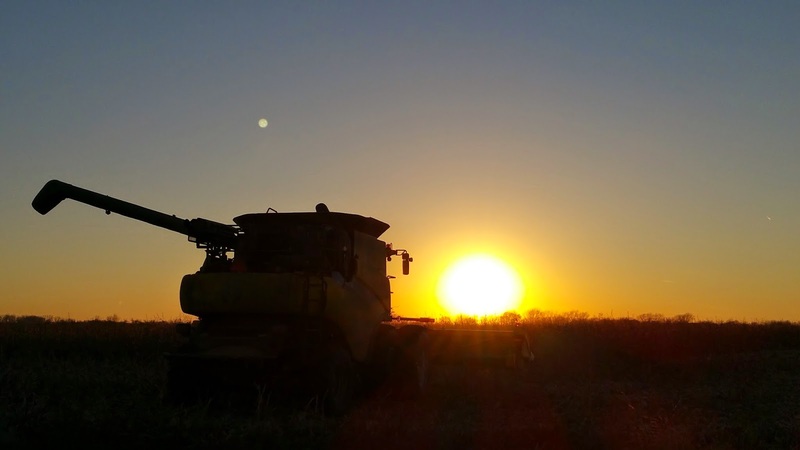 Like this photo — if I had gone the day before, the combine wouldn’t have been there and lined up with the sun perfectly like it was. It’s a good lesson to always go into everything with fresh eyes — no matter what you’re doing, there is always a new way to look at something or something different in the scene. Perhaps that’s why I like landscape photography so much — there’s always something different through the lens. So, the doll to the left has caused quite a stir at the paper recently. Seems a voodoo-like doll unsettles many people. A little back-story here: I found this doll while on a walk with two co-workers, Tina and Leann. I’ve seen these dolls before in gift shops and they’re kinda cute so I picked him up and took him back to work. When I got back to work I dropped him off at our publisher’s desk. Creeped out by it, he dropped it on a reporter’s desk. 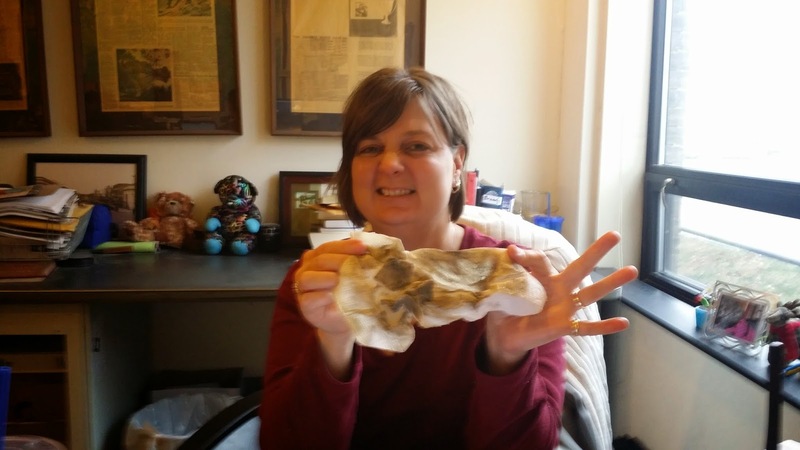 She reacted similarly and put it on another reporters desk. Yes, that thing is still in the building. 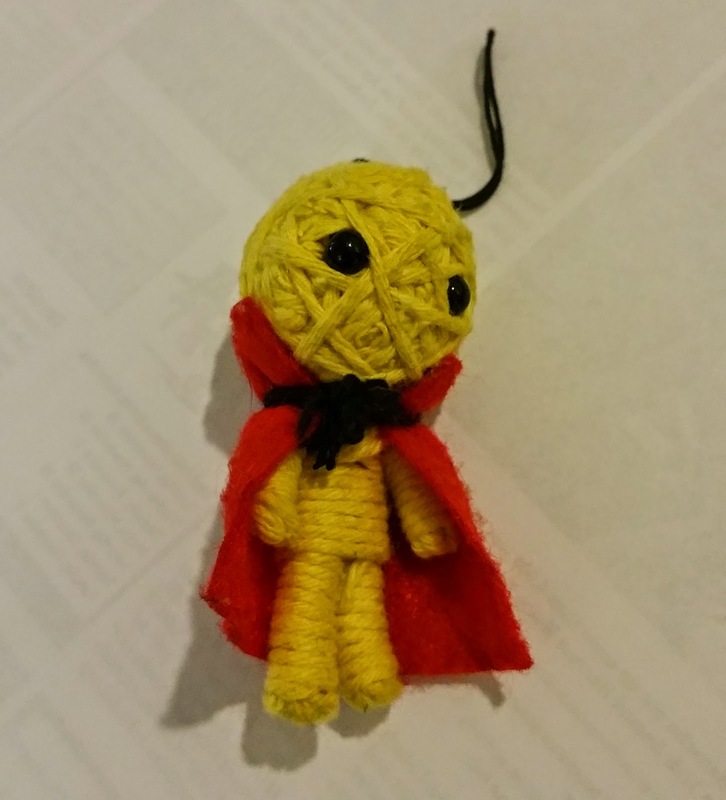 Leann found the following: first, he is a string doll — not a voodoo doll. His black eyes were created to repel negative energy; his red cape represents power; and his yellow body color represents success. Edited (Nov. 20): The doll has been returned to where we found him — just in case. 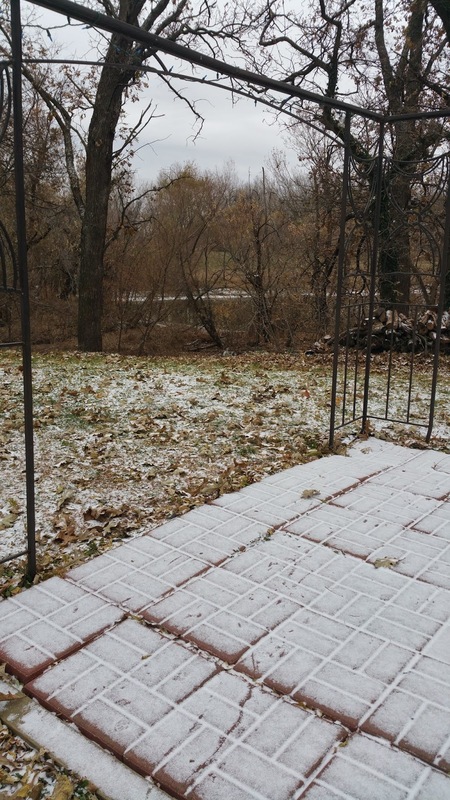 The first snow was expected in the area on Saturday. Weekend reporter notified. Check. Photographer notified. Check check. Statuses scheduled for social media asking for cancellations/delays. Check check check. Winter weather advisory posted. Check and again check. Saturday morning comes and there was but a trace of snow — as seen on the left. Mild disappointment on my part. There is something special about snow. About the silence that ensues outside after several inches of new-fallen snow. There is something REALLY special about how the snow sparkles in the moonlight and how the stars seem to be several times brighter in the cold winter air. Despite the extra work the snow causes those of us in the media industry, I love snow. I love standing outside and listening to the snow. Yes, it has a sound when it’s coming down and there is a distinct sound of nothing after it’s done falling. For my post on winter’s silence, see here and here the joy of snow. So Saturday was a false alarm for us here, but I’m waiting (and embracing) the next one. Saturday is the one-year anniversary of my dad’s death in a house fire. Tonight I got out my journal that I kept after the fire and read through it. I went through an entire journal the weeks following the fire. I put my words in there, the eulogy I wrote for the funeral, all the sympathy cards I received and photos. When I read my own words which bounced between extreme, raw grief to anger, to anguish, to confusion, I’m reminded of those days following. Those horrific days. But what made me tearful were the sympathy cards. Those gestures of kindness from people — family, friends and people in the community who know me through the paper. And this was a good tearful — one that reminded me how precious people around us are. And I’ve come to this conclusion tonight — never, ever underestimate the power of a sympathy card or a thank you note. I saved every single sympathy card and taped them in that journal I kept. They mean so much to me still, nearly a year later. To every single person who sent me notes, texts, emails, who called me…I have your names written in my journal. Those gestures held me together that week. I am sincerely grateful. To anyone reading this, reach out to someone. Hug your loved ones. Do something kind today out of the blue. 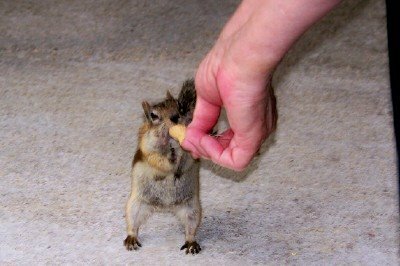 You never know who you’re going to touch and how badly they may need it. I’ll never forget the simple gestures after the fire — it doesn’t take a lot to make a big difference. I’m lucky. And blessed. And so so grateful. Saturday, it will be a year since a house fire claimed the life of my father, Charlie Adams. I won’t pretend this was an easy column for me to write, but I know he would be so proud I wrote it for him. Dad died early morning on Friday, Nov. 15, 2013. A fire broke out at the house he and my mom lived in at the time. Mom, who is a school bus driver, was at work when the fire happened. I was preparing to go to the airport to go to Nashville, Tennessee. I had just made a waffle at the hotel when I noticed I had three “missed calls” from my brother, Dalton. In my heart I knew it was bad even before I called him back. When I called him back he said the words I’ll never forget: “There was a fire at Mom’s house and Dad’s gone.” Mom also lost her dog, Twister, and cat, Jersey, in the fire. In that moment, the world crumbled. My mom’s world crumbled. My family’s world crumbled. Myself, along with my brother, Dalton, gave the eulogy at my dad’s funeral. In honor of him — I’d like to share it with you all because, even in my raw grief of nearly a year ago, these words still say it best. I had the privilege of calling this man we are honoring today, Dad. He was the dad he didn’t have to be to us. I rarely refer to him as my stepdad — because he never once put the word “step” in front of my brother and mine’s name. We were always introduced as his children. Never once did I ever feel like a stepchild. Dad was a simple man — he loved and he loved deeply. He loved my mom with every fiber of his being. She was his world. He loved his dog, Twister — who we lost in the fire as well. We also lost their cat, Jersey in the fire. They are all somewhere — together. Looking back I have so many wonderful memories of Dad. He helped me work on my Pontiac Sunbird — he wanted to make sure the speedometer was correct. So he drove beside me in his car on Kellogg (in Wichita) and he held up one finger for 40 mph and two for 60. It probably was quite the sight. But that’s the kind of man he was. Then there was the time I scored two tickets to a monster truck show. We spent the evening cheering on our favorite monster trucks. He loved hanging out with us kids — no matter what it was we were doing. Again, that’s just the kind of man he was. Looking back at family pictures, dad was frequently in them. My school graduations. Holidays. Birthdays. Life won’t ever be the same without him. Dad knew no stranger. He would spend hours talking to people and telling stories of his life. He truly loved everyone and could bring a smile to anyone’s face. He was funny. Witty. Dedicated. And loyal. A truly amazing person. I will miss his humor. I will miss him — the world lost a kind, amazing person. His life had a profound effect on mine — and on many others, I’m certain. 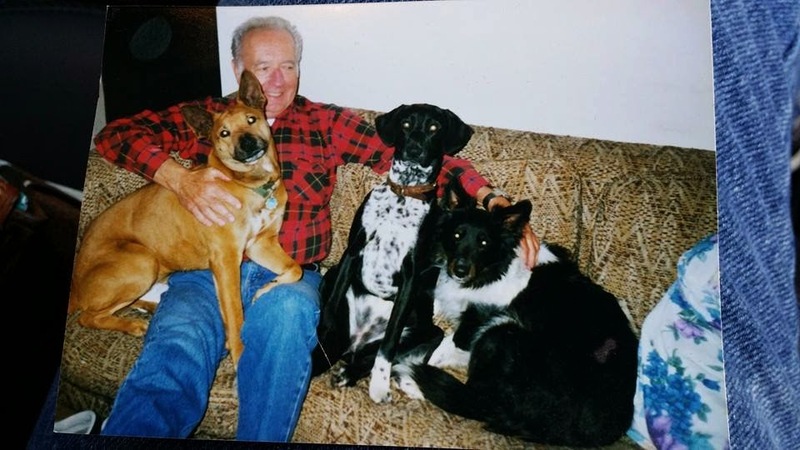 May he rest in peace and run with his beloved dogs Twister and Flower. I’m certain he’s looking down while idly chatting someone’s ear off — telling them stories of his past and his family. He wouldn’t want us to be sad. Or mourn him. But how can we not? He will be missed deeply and dearly. I’ve been working hard on my book, “Breaking Point.” And I’m to the point in the novel where I realized it’s time to fine-tune some parts (especially the crime scene parts in the novel). And that’s when I realized — I have a lot of questions about crime scenes. As the questions kept popping into my head, naturally, I wanted to turn to Google. But, really, it’s probably not a good idea to Google the sorts of things that I have questions about. Uh? Creepy much? I will admit I had a pretty good (nervous) bout of laughter out of that one. So, I’m excited. This novel is REALLY happening! I can’t wait to get it completed and start the next leg of my journey — to publication and introduce the world to my main character, Chloe. There really is nothing else on this planet like bacon. Today, we really pulled it off at the paper. The Gazette’s first — and probably infamous — bacon bar. We had bacon ice cream topping. Bacon pretzels. BLTs. Bacon cookies and cinnamon rolls. Bacon dip. And a host of other amazing goodies. Who knew bacon was such a versatile food? I’ve always been a purist when it came to my meat and sweets but today, I’ve been converted. Sweet, salty … mmm … I’m all in. The funny part of this whole day was when we cooked the bacon on-site. You could seriously smell the bacon from the street before you even entered the main Gazette building. It took the better part of today just to clear the building of the bacon smell. Many more of us likely will be carrying the bacon scent home in our cars, clothes and hair. (I know at lunchtime when I went home to walk my dogs, they were pretty interested in my clothing). More than just the bacon today, I am reminded of how creative my coworkers are. How willing they are to participate in massive food days. How giving they are (because it takes time to cook). I work with some pretty creative and some amazing people. (And a boss who doesn’t mind if we fill the entire building with all-things bacon). Now, I’ll need to walk 20 miles just to work off half my bacon! Today, friends, is Day 365 of my daily gratitude posts on Facebook. Well, ok, Nov. 1 technically should have been Day 365, but somehow I lost four days in the last year. I started this challenge on Nov. 1, 2013, as a part of the typical November 30-day challenge I saw many of my friends doing. On Nov. 1 I began posting my daily thankfuls. On Nov. 15, the world stopped. My dad was killed in a house fire. I could have stopped right then and there (and I considered it), but as I helped my mom pick up the pieces of her life — she had lost her husband, her animals, her home, life possessions, everything — I realized there were a few bright spots. Those came in the form of help from the Red Cross, The Salvation Army, people who had heard about the fire on the news, my mom’s church, friends and family, and so many others. I began to be grateful for those things and I decided to keep the posting going because in those moments after the fire, I needed to see a shred of light in life. When the sun set on November last year, I just kept going. It had become a daily part of my life — and one I had started to rely on after the fire. In the last year I’ve kept this going. 30 days. 90 days. 300 days. And now an entire year. Today, I am grateful that I’ve kept this up for a year. 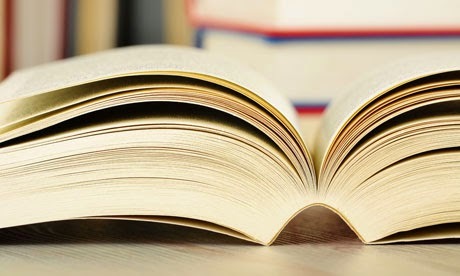 I’m grateful for the people who read them. And I’m grateful that so many of my friends are taking part in the challenge for another November, because I really do enjoy reading what others are thankful for. Thank you, everyone, for the last year. And yes, I will be continuing this. I had considered not continuing this, but after much thought and realization that it does help (a lot), I have decided to continue.